A struggle for survival is taking place in the Willamette Valley’s farm economy. Either grass seed or specialty vegetable seeds may not survive. 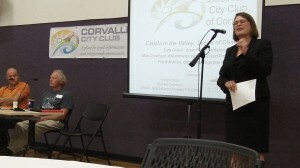 That’s the impression I got from a discussion at the Corvallis City Club on Monday. Grass seed growers, no longer allowed to burn their fields every few years, need an economical rotation crop as grass varieties are becoming resistant to chemical weed control. They have found it in canola, the oil of which can be processed as fuel. But canola is in the same genus, brassica, as vegetables such as cabbage, cauliflower and broccoli, grown for seed in the valley. Even the possibility of cross fertilization of these specialty crops would make the seed unsalable on the world market. So the fields are isolated and widely separated. Canola on nearby grass seeds fields every few years would wipe those specialty seed growers out. The 2013 legislature passed an amended bill originally sponsored by Rep. Sara Gelser of Corvallis. The bill bans canola from the Willamette Valley through 2019 but authorizes Oregon State University to do research on a few experimental fields. The specialty seed people will cooperate with the study even though they don’t believe it will find a solution. At the city club meeting, I listened to Gelser and growers Matt Crawford of the Canola camp and Frank Morton of the specialty seed group. I came away persuaded by the farmers that canola as a rotation crop and the specialty seed industry cannot coexist. Unless OSU researchers come up with a miracle in five years, Oregon lawmakers will have to decide in favor of one or the other. From Jana Seeliger, Corvallis: My husband and I were talking about and trouble-shooting the specialty seed crop versus canola questions. I also attended the discussion earlier this week. I had one thought: the specialty seed growers have been an ongoing and I think growing part of the marketplace for some decades. Also, the small organic farmers have been coming along for many years. As time goes by, it seems reasonable to project that the growth in organic farming as a sector of agriculture in this country and in the valley will continue? So that the economic gains will increase in a gradual and predictable manner (steady growth)? I think that is reliable, and desirable in the face of climate change and population dynamics in our area.